I have been working on samples for the Framed Clutch Purse class I will be teaching at Sew South in March. Although I have written the instructions with the suggested batting and interfacing I am playing with a few others to show my students a variety of weights and textures that some different interfacing will give to the clutch. I lined it with a Lotta Jansdotter Echo print. For this one I used a piece of a cute quilt weight fabric. I know, you're asking WHY WHITE? I sprayed Scotch Guard on the fabric before making the clutch. I fused Pellon Craft Fuse 808 to the outer fabric before fusing Thermalam to the backside of the outer fabric. I also fused Shape Flex to the lining fabric. This makes for a very firm clutch, but it holds up well and doesn't look squishy. 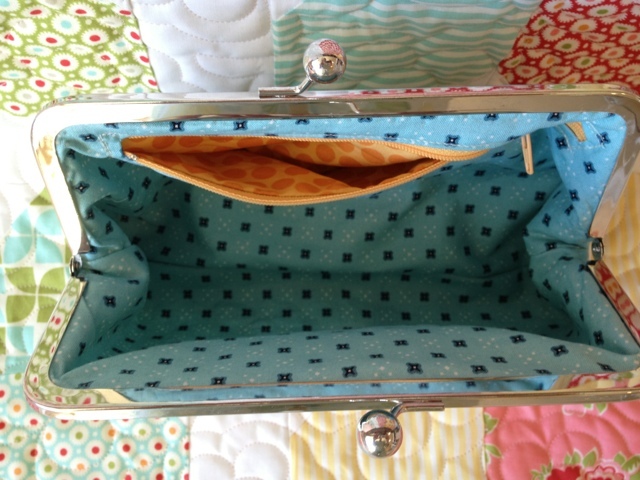 Since I did not do any quilting on this clutch, I think using the extra interfacing makes it look better. I also placed an inset zipper pocket into the lining. I need to make a few more samples in different stages so I can demonstrate techniques for the Framed Clutch newbie. 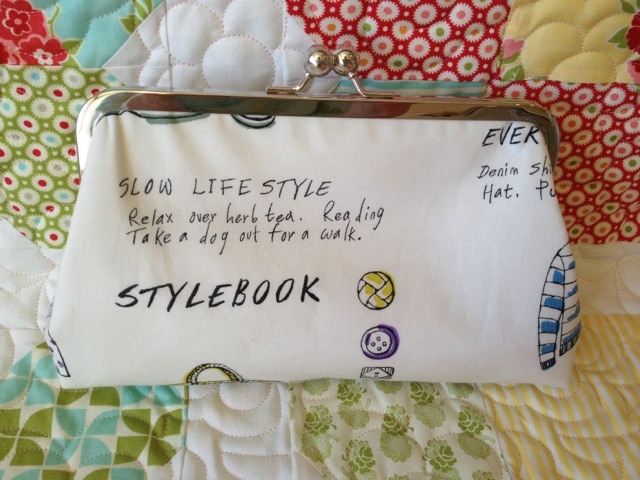 You can purchase my pattern for the clutch on Craftsy. Such pretty purses Di - I know you are going to be such an awesome teacher. I nearly ordered some thermolam yesterday and didn't in the end - now I wish I had. You are going to be the BEST teacher Di! Both these purses are just wonderful! You have such a variety of interfacings and the like over there...those names (thermolam?) mean nothing to me! Lovely clutches and you are going to ace the teaching. Love the fabric you used on the outside of the second clutch! So looking forward to being in your class in 2 months from now! You'll do a great job Di! I'd love to take a class from you. I can't do frame clutches. I've tried once a few years ago. It is tricky to get the shapes right to fit the frame. They both look so great. The one with inner pocket is nice! These are looking super! What lucky students you have! These are so great, thanks for sharing. I started a new metal frame clutch with a friend yesterday and we didn't get too far... wish I lived close and could attend your class. Love the white one. So cute. The look fabulous! I wish I could come to your class! I wish I were coming. How do you have time to do this as well as everything else! Love that you even put zippers inside! Your students will be pleased! I wish I was coming but I had already committed to QuiltCon. Your class is going to be so fun, having all the different samples lets people see the differences which is the best way to learn. I totally wish I was going to Sew South! I think with you as a teacher I MIGHT be able to conquer this. The fabric is a home decorator weight, I think I have a labeled swatch somewhere and will double check if you need the info. Love all of the samples you showed! Love the all the different purses! Especially the one with the inside zip! So looking forward to your class! The grey fabric is Outside Oslo - I have some in a great blue,red and natural color. Great print! You're teaching at Sew South?! How did I miss this?! Congratulations! That's awesome!